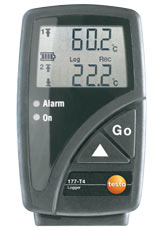 The Testo 177-T4 professional data logger with up to 4 external temperature probe connections for simultaneous temperature measurement at different sites. Fluctuations in temperature e.g. in production processes, in laboratories etc. often influence the overall result. Surface, immersion and air probes enable adaptation to the respective measurement task.